I can’t proudly call my teeth "pearly whites" because of the enamel-staining food like chocolates, tomato-based pasta sauces, iced lattes, and green juices (because #balance!) that I have consumed for the past X years. I did try insta-white toothpaste variants and mouthwashes in the past, but I knew they couldn't give long-term results. I also didn't want a dentist to brighten my yellow teeth via bleaching, because I am not a fan of chemicals causing tooth sensitivity. 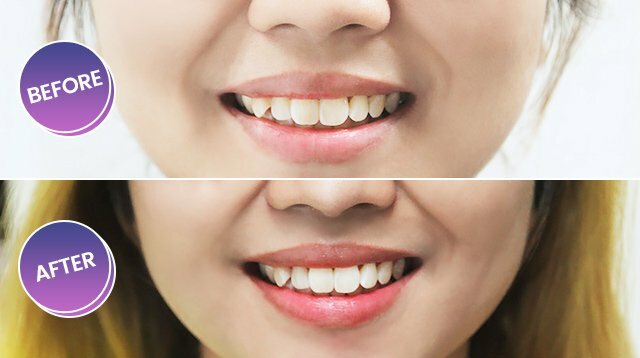 Your teeth wouldn't exactly be as white as you’d want them to be. According to Michelle, your teeth can only get as white as your eyeballs. If they get lighter than that, they can look fake. Plus, it depends on your habits—coffee-drinkers and smokers are more susceptible to teeth stains. 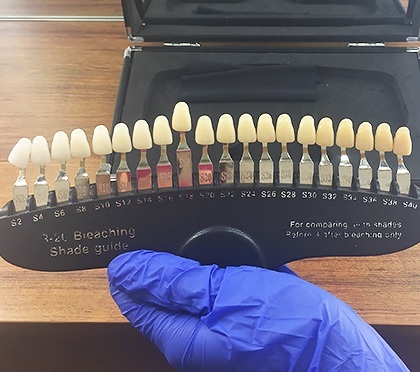 We proceeded with her taking my current shade based on their tooth color chart. I got the Triple Whitening Treatment because I wanted to flash a bright smile the soonest. I was so excited to find out how light the results would be. I plopped to an egg-shaped couch to receive the treatment and was offered to use an iPad to entertain myself as I would have to sit still for a long period. Michelle also offered their speedy Wi-Fi and asked if I would like to have my phone charged. After brushing and gargling mouthwash, I was asked to bite a clear, cushioned plastic lined with their brightening gel for 60 minutes. There was a 30-second break after 20 minutes for reapplying a fresh coat of the treatment. An LED lamp was placed on my mouth to activate the whitening ingredients. I know it sounds painful and uncomfortable, but I did not notice the time pass because I felt cozy on the couch while watching YouTube videos. When I was done, Michelle compared my teeth again to their color chart and showed me that I went four shades lighter. They weren't toothpaste-commercial white, but the years of bingeing on chocolates were almost gone. My smile was definitely brighter than it was before. Normally, when you get a teeth-whitening treatment, you wouldn't be able to eat anything colored for 72 hours because it could leave a pronounced stain. I didn’t like narrowing down my food choices so I got NanoSeal Total+, which prevents the enamel from absorbing any unwanted tint. I was free to drink and devour what I wanted. I was also told that I could flaunt my bright smile for up to six months, depending on my lifestyle. Does it work: YES. It can turn your teeth four to six shades lighter. How long does it last: Four to six months, depending on one's lifestyle and dietary habits. 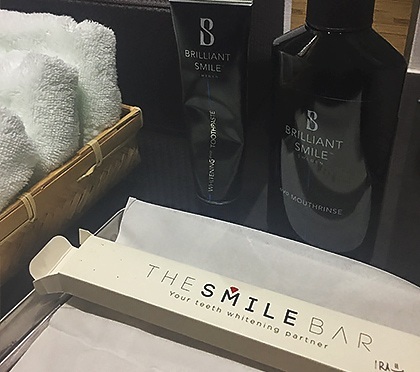 The Smile Bar is located on the second floor of Uptown Parade in Bonifacio Global City, Taguig. Visit their website for more info, or contact them at (02) 541-2853 / 0917-1485659.